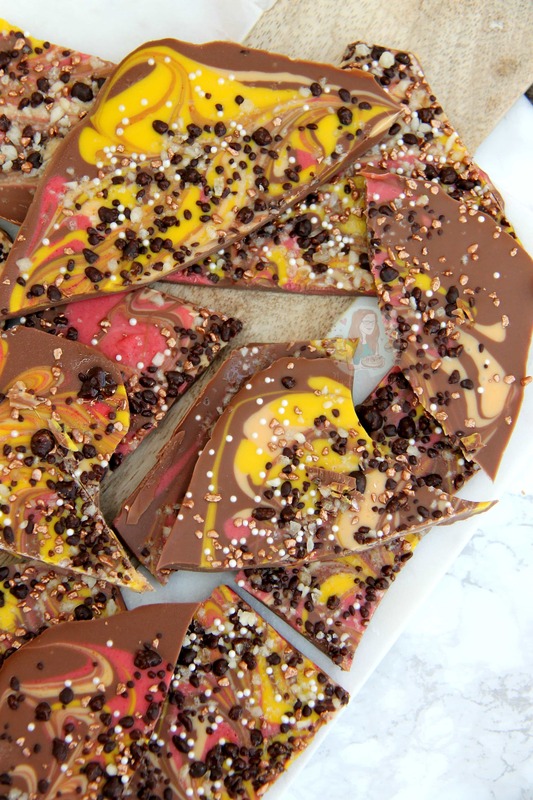 Chocolatey, Colourful, Popping and So Easy it’s ridiculous… Bonfire Night Bark is the Perfect Last Minute Treat! So the other day I was craving something chocolatey… and as much as I am trying to post two new recipes a week, or maybe one new one and a video tutorial of an old one, I just couldn’t resist squeezing this little beauty in. 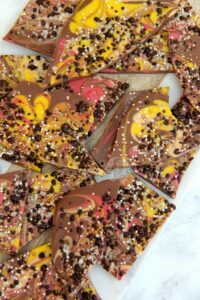 I realise I have a ‘Chocolate Bark’ recipe for nearly every single theme possible now such as my Easter Bark and Christmas Bark, but Bonfire Bark? YES PLEASE. I will admit that there was a slight issue with this bake; the red food colouring just wouldn’t go red. I think I had maybe accidentally got some pink into the pot, my bad, but either way, the yellow and orange worked well! I always try to use Oil Based food colourings now when I colour white chocolate as its apparently meant to work best (along side powdered colourings) but I clearly did something wrong. Ooops! However, the wonderful thing is, it still tastes chocolatey, poppy and delicious in this. You can easily whip up this treat as a last minute tasty sweet, or prep them slightly in advance, smash up into pieces, and bag them up for a little bag of Bonfire Night Bark! It’s up to you. I personally make Chocolate Bark all of the time as I make many a Chocolate Explosion Cake, but when it comes to themed chocolate bark?! Getting some theme appropriate cellophane bags and handing them out as mini presents almost is just too easy and good. Enjoy! 2) Melt the Milk Chocolate in a Heatproof Bowl over a pan of Simmering Water (a double boiler) don’t let the bowl touch the water! Slowly melt it and stir gently. 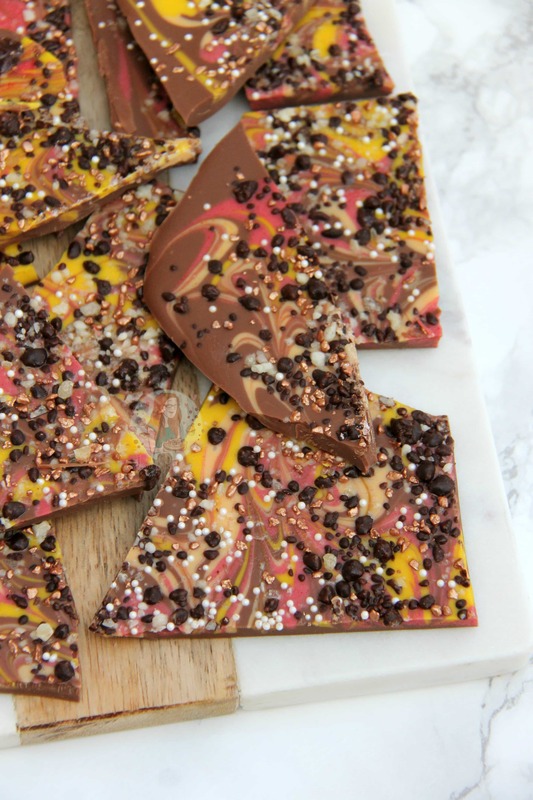 4) In a separate small bowl, melt the White Chocolate either on another double boiler, or in the microwave! Separate into 3 different bowls and colour them Red, Orange and Yellow for the colours of fire! 5) Pour the melted Milk chocolate into the tray and spread so its even, drizzle over the coloured White Chocolates and swirl it with the end of a cake tester to make a pretty pattern – Sprinkle over your popping candies, and sprinkles, and leave to set – I do this in the fridge! I keep mine in the fridge so that it stays hard and delicious. Out of the fridge may cause it to be a little squidgey! 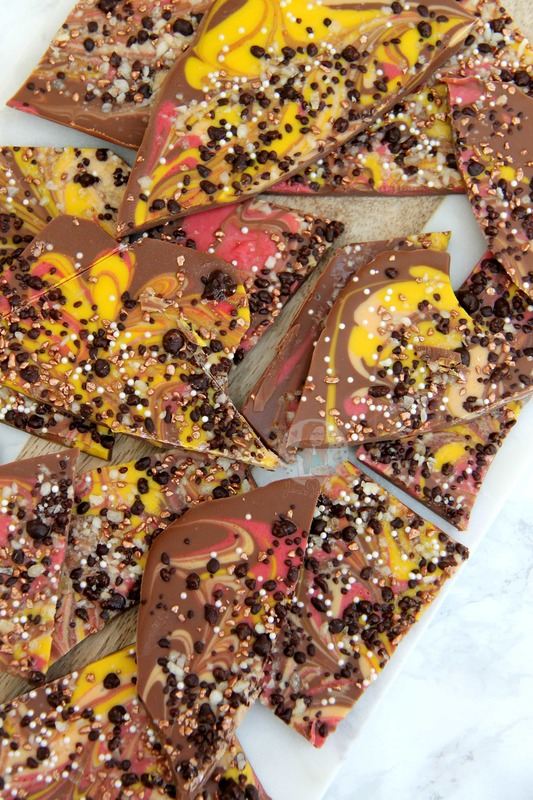 You can obviously use whatever sweets & chocolates that you fancy, anything Halloween or Bonfire Night coloured or themed would work very well! I stuck to popping candy for the ‘POP’ of fireworks! 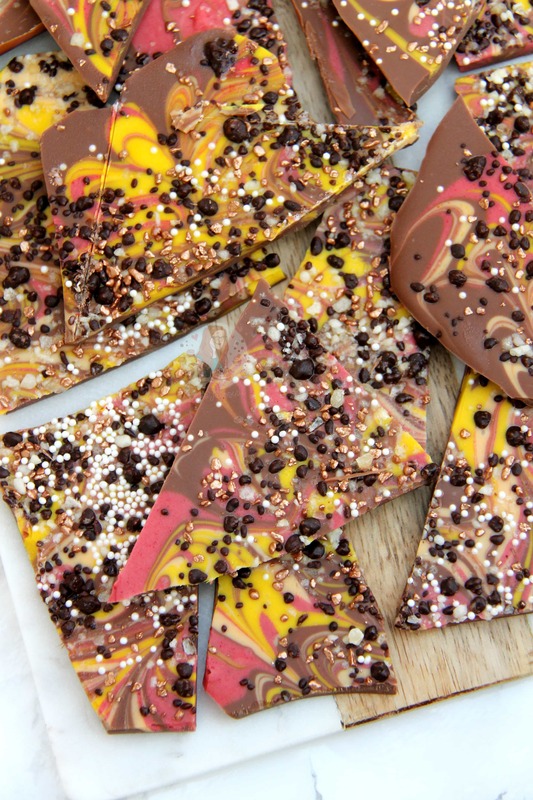 Find my other Bark & Sweets Recipes on my Recipes Page! Older Next post: S’mores Cake! Newer Previous post: Cherry Bakewell Cupcakes!